Preheat the oven to 190°C (conventional) and boil a kettle of water. In the meantime, grate the carrots. Combine the shredded and chopped chicken and garlic in a bowl. Add the cinnamon, salt, onions and olive oil. When adding the grated carrot, squeeze it tightly over the chicken mixture to allow some of the juices out. This juice will help to bind the mixture and make it easier to mould into balls. 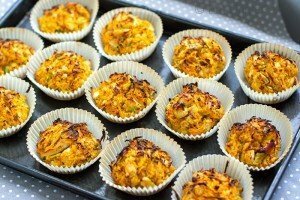 Using a pastry brush or your fingers, grease the bottom of the muffin/cupcake wrappers and place them on a flat baking tray/sheet pan. Shape 1-2 tablespoons of the mixture into a small ball/patty using your hands and add it to the wrapper. Press the patty down slightly/. Continue with the rest of the mixture.